This is easy and cheap and good. You’ll need a pot of thick yoghurt, preferably Greek or Lebanese. Some lemon zest, pink peppercorns and sea salt. A hook or a tap. Some cheese cloth or a thin tea towel. A jam jar. Some olive oil. Stir the zest, the peppercorns and salt into a pot of dense white yoghurt. Taste. 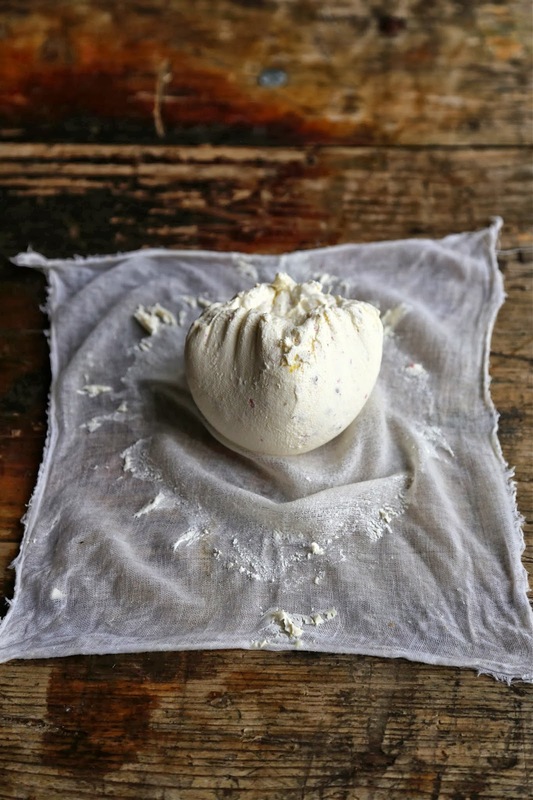 Lay out your square of cheese cloth and empty the yoghurt into the centre. 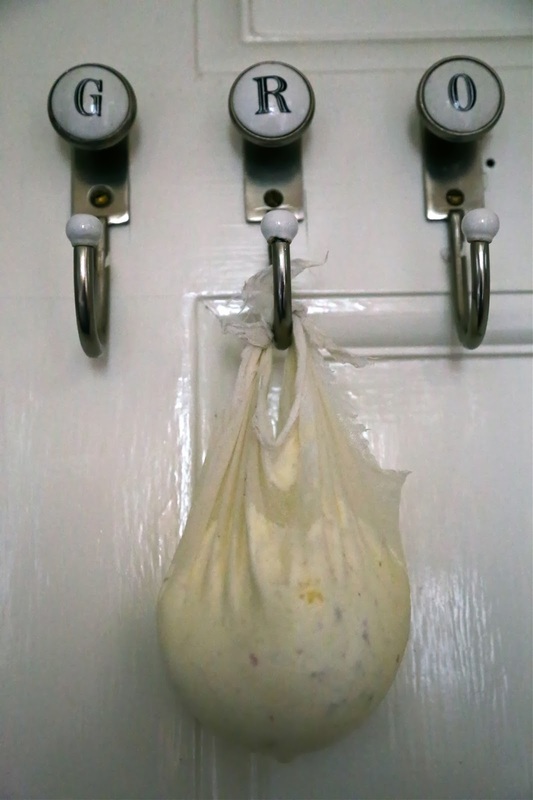 Tie two knots, tying them from opposite corners and hang the yoghurt ‘bag’ onto your kitchen sink tap or a hook with a bowl underneath. Leave overnight or longer if you want it drier. If you collect the liquid that has dripped into the bowl, this is whey, you can use it in bread or to feed plants. Take a jam jar and sterilise it by washing it in hot water then baking the jar on a medium oven for 15 minutes. Or put it through the dishwasher on a hot wash.
Then fill the jar halfway with olive oil. 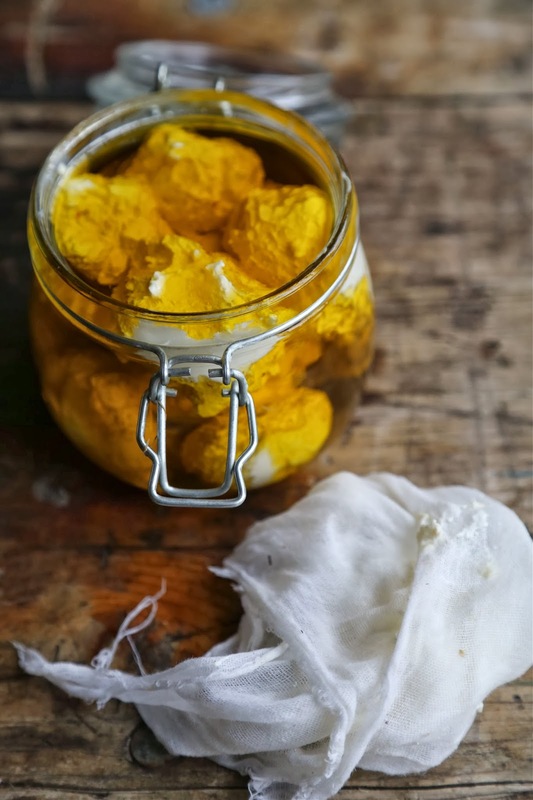 Take the labneh cheese and roll it into golf ball size rounds and place them into the olive oil filled jar. Make sure the balls are covered with oil when you have filled the jar. This can be eaten meze style such as pitta bread, fresh vegetables such as carrot strips, radishes, spring onions, hummus, baba ghanoush, tabouleh. Accompany with fresh herbs such as parsley, mint, coriander, winter savoury gathered together on a plate. Pick up the herbs, ram them into flat bread with a ball of labneh smeared. Scatter some more salt and pepper, or another squeeze of lemon. Try it with salted sour grapes which you can buy in Middle Eastern shops. What is cheese but a way to preserve milk? This lasts a month in the fridge. I've seen a few recipes for labneh and knew it wasn't complicated, but yours seems a bit less fussy than most. I suppose it's not what you say but the way you say it. Thanks! 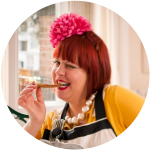 Great recipe and lovely photos that make me feel I must make this. Thank you. Mmm love simple cheeses such as this. Would be great cold smoked with beech or apple and then stored in oil. Have done similar with homemade goats cheese. Thats a great idea Marcus. Cold smoked would be delicious! Thanks for this awesome post.i just liked the recipe. Fiiiinally made labneh for the first time a few weeks ago and kicked myself for not doing it sooner. I think these could make really nice Christmas presents. I'd love to be given a jar anyway!